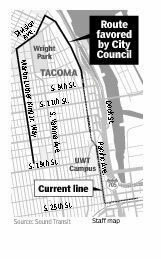 Tacoma City Council has approved the alignment of a route extension for the city's starter modern streetcar line (which is branded as "light rail") and forwarded the recommendation to Seattle-based Sound Transit which would fund the project, the News Tribune reports. The extension would raise the total route length to 3.9 miles and the section on MLK Jr. Way would be double track rather than a couplet of single track on paired streets. The approved route would run southwest along North First Street from Stadium Way, then to Division Avenue and south along Martin Luther King Jr. Way totalling 2.3 miles of additional route. The estimated cost of the extension is $150 million, of which $50 million would come from Sound Transit, another $50 million from federal grants, and the remainder from yet-to-be-identified sources.